I leave for New York next week for fashion week!! I can’t believe it’s already that time again.. I’m excited to see my girls Rachel and Mara again so soon! Usually it feels like I haven’t seen them in forever by February, so I’m glad I had a chance to visit each of them in between the last NYFW and this one. Sadly Emily will not be joining us again this season – she does have a precious new baby boy to look after, after all! Speaking of Rachel, I’m so incredibly proud of this girl! Yesterday she launched her first jewelry line, Pink Peonies Collection, each piece is insanely beautiful! My favorites from the collection? The geo pave cuff and this linked cuff. So chic! Click here to discover and shop the whole collection. Congrats Rach!!! With my trip to NYC next week, I’m gathering the troops (aka my clothes) and trying to decide what to take with me! After several years of attending NYFW, I’ve found that it really doesn’t matter what you’re wearing underneath when it’s as frigid as it always is in New York in February. I’ve decided to focus on my outerwear, so last week I ordered quite a few coats from ASOS just so I’d have a different look every day. You’ll obviously see these coats on the blog soon, but I wanted to share my favorites so you could order before they sell out! The most classic of the three is this black textured-wool coat. Can you believe I didn’t have a basic black coat? So weird. Anyway, this one is amazing and the fit is wonderful – it’s also only $150. Yay! I love it so much, I actually also bought it in this berry hue. On the brighter side of things, I picked up this vivid red coat. It makes quite a statement, don’t you think? Finally, for a softer shade that’ll also be a pretty neutral to transition into spring, this pale pink coat is a keeper! Click here to shop all ASOS brand coats – they’re at such a great price point and always on trend! These pieces are making me dream of spring! Will be waiting to see how you style the coats..the pale pink one is heavenly! 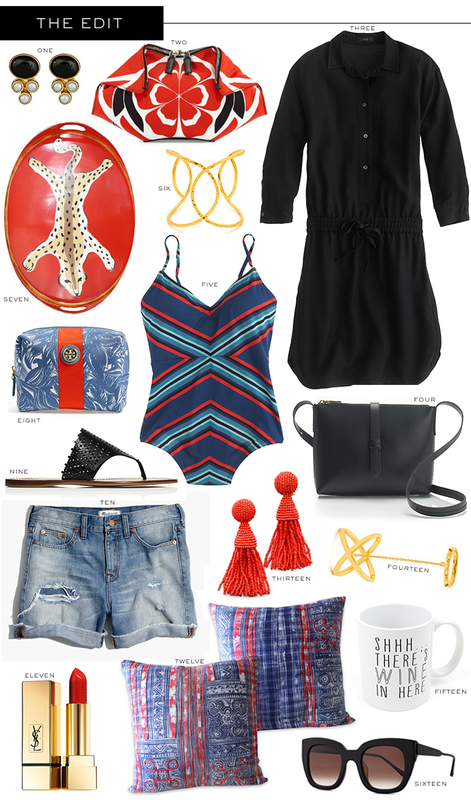 Love all these fun items the red earrings and the shorts are my fave. Have fun at fashion week. I love that J.Crew shirt dress!! Obsessed with that shirt dress and that striped one piece!! Love the coats you choose, especially the pale pink one. Also adore the earrings and black bag from your edit. Can’t wait to see the red coat, it looks so chic. Sadly sold out in my size now! Have a great time at NYFW! Great round up. Love the color palette here! Love all of those picks. The pop of red in this is perfect! Number 7 is so cool! Can’t wait for fashion week! Love the mug! I’ll take one of each! Love this round-up! Totally in love with those throw pillows Merritt! Love this edit. P.S. I have an amazing cash giveaway up on the blog – I hope you’ll check it out!